It is interesting to note that much of the equipment on this page shown for the US House of Representatives is the same type of equipment installed at the Grand. Ask for a private tour if you would like to see what is left of this system. I'm writing to you as an amateur historian because I've been following the popular internet claim about The Grand being the second air-conditioned movie house in the U.S. I felt compelled to put in my two cents before that bit of family oral history became a permanent part of your fundraising advertising. The Grand was not the second air-conditioned theater in the U.S. Nor the third. Nor the fourth. Paramount's Rivoli Theater on Times Square in New York launched the Carrier Cooling System on May 25, 1925, just three months after the Grand opened (without air conditioning). Within a year most major cities in the U.S. had at least one air-conditioned theater. By the time Steubenville's Grand had a Carrier system there were three in New York: the original Rivoli, the Roxy, and the Ziegfeld. According the stories and ads in the Herald Star, the Biggios visited several of those movie houses before signing with Carrier themselves. "It has been the pleasant experience of the Grand management," read an ad announcing the air conditioning, "to visit some of the theaters in the country which have an air conditioning system such as that which we have installed in this theater." 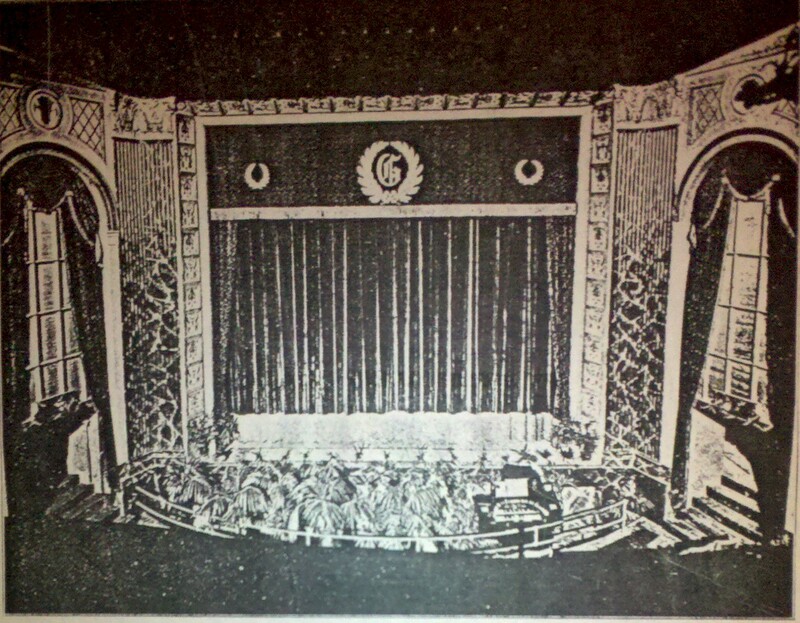 The Grand presented its cooled theater on Friday, June 24, 1927--a little over two years after the first one in New York. But so what if we can't enjoy the claim that Steubenville had the second ever air conditioned theater? We can at least enjoy a more modest, but true claim. 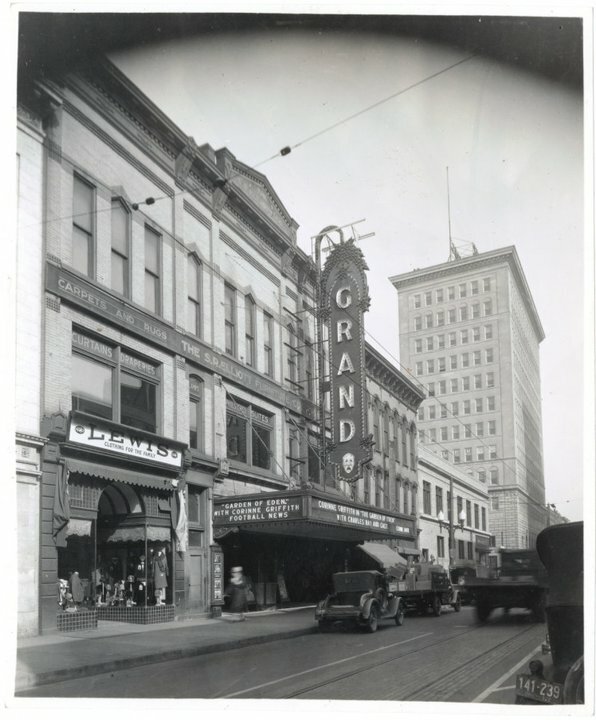 The Grand was the first air-conditioned theater in Ohio. This claim, in the June 24th ad, is something I want to investigate, because the wording is very curious, "First System in Actual Operation in Ohio." It makes me suspect that the major cities of Ohio were in the process of installing Carrier systems, but the Biggios got theirs up first. That's something to crow about. My next local history book, if I ever get around to writing it, will be about Steubenville's theaters (both stage and screen). The Grand, of course, will be as big a part of it as I can make it. STEUBENVILLE - It was originally built to house a saloon and a livery station in the 1880s by a German immigrant and was converted into a theater in the 1920s. Today the Grand Theater is an auditorium filled with seats, a water-soaked wooden stage and falling plaster. But Scott Dressel, chairman of the Historic Landmarks Commission, said he can look past the aging interior and see a theater once again filled with movie and stage patrons and "the glory of the past years." According to John Griesinger of Steubenville, the large, warehouse-sized room above the lobby area of the Grand Theater once was home to the extended Griesinger family and visitors who included Buffalo Bill Cody. "My great-grandfather Jacob Griesinger drove a stagecoach and that is why he built the livery stables. Plus he had the saloon and restaurant," related John Griesinger. "In 1924 the four Biggio brothers (Charles, Edward, Howard and William) leased the property and tore down the livery stables and built the auditorium for a theater. At that time it was the second air conditioned theater in the country and was modeled after a theater in New York [please see AC note above]. The lobby was known for its mosaic tile and beautifully detailed painted interior. The theater was also known for its art deco style," Griesinger continued. "I grew up in that theater," Mary Martha Biggio Salata remembered. The daughter of William Biggio said after classes ended at Holy Name Catholic Grade School she would walk to the theater. "I held my fingers up to my mouth to shush the ushers, walk down the aisle to the third row from the front and hunch down in my seat. About 4:30 or 5 I would feel a firm tap on my shoulder. It was my dad telling me it was time to go home for dinner," recalled Salata. "My father was very strict about the movies I could see. Shirley Temple movies and anything considered of an uplifting educational nature were fine," she added. "The Grand in those years was very elegant. There were two ushers during the day and four or five ushers during the evening hours. And they all wore tuxedos. There was no popcorn sold in the theater but in the later years a candy dispenser machine was installed in the lobby," said Salata. "My best memories of the Grand were when I was in junior high school and I was permitted to fill in for the cashiers who sold tickets from a small booth at the front of the exterior lobby. It was absolutely wonderful to sell tickets to customers although my school classmates would expect to get into the movies for free. It was a very glamorous and exciting world because I felt like I was part of the entertainment world. I could read Variety and the Hollywood Reporter. I felt I was on the cutting edge of the entertainment industry," continued Salata. "There were so many theaters in Steubenville those days because everyone went to the movies. The new releases started every Thursday and I would often see the same people every Thursday. It was mostly mamas and papas going out for the evening. 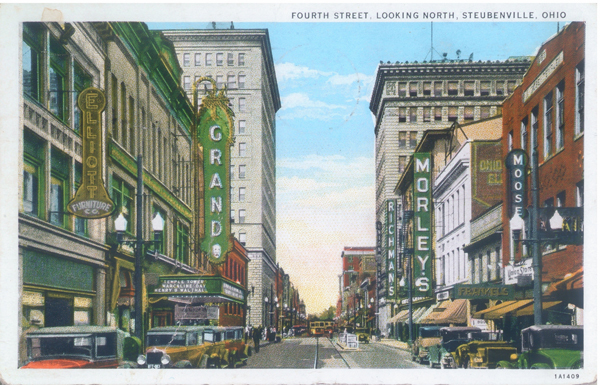 It was during the Great Depression and theaters were big in Steubenville. The movies, and especially the musicals, helped people forget the hard times for a time. And about three or four times a year the movie production company would bring in live entertainment as an added attraction," Salata said. "I know the theater has deteriorated. It is sad. But if there is a chance to save it I would like to see that happen. It was a great place for entertainment," she noted. Tina (Micucci) Chambers walked through the theater last week and remembered going to the Grand on Easter Sunday. "A bunch of parents would drop their kids off at the Grand Theater after Easter Mass and we were good for at least a couple hours," Chambers said. Chambers said she has been told the last movie shown in the Grand Theater was a Disney film, "which was probably the most appropriate." For Janice Straker Maze, a former city resident, the memories were fun and on occasion embarrassing. 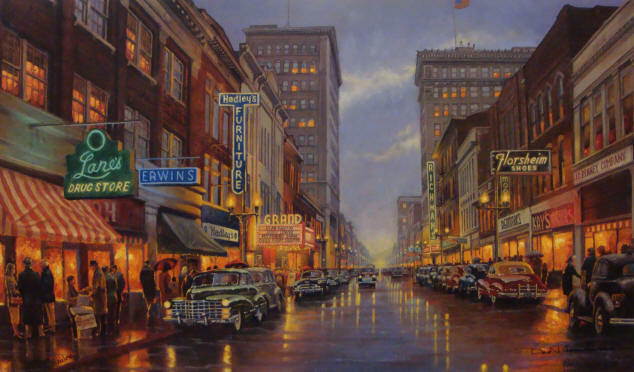 "As a child, I loved going to the movies at the Paramount and the Grand. I remember a woman who worked at the ticket booth gave me a hard time when I went to buy a ticket because she said that I was not a child and needed to pay the adult price. I was tall for my age. I, of course, only had enough money for the child price. We went back and forth about this and she finally let me in. I remember that I was with friends and other people were in line and it was really embarrassing. One other thing I remember is they used to have movies where the monsters came out of the screen. The screen would go black and the lights would go out and you would see people coming up the aisles with masks on. "One of our friends, who was on the end, crawled over everybody so that she could get to the other side and not be on the end. It was hilarious," Maze recalled. Griesinger explained the Dipson brothers took over theater operations "sometime in the 1960, then it was operated by a Pittsburgh-based movie theater company and was closed, re-opened for a short time and then finally closed for good in 1979," said Griesinger. "At that point several Griesinger family members all owned a share of the property, but it finally came down to my sister and I," noted Griesinger. "I always liked the Grand because when I was a child we had passes from the Biggio brothers because our family owned the property. I could go to the movies for free whenever I had a chance," Gwynne Griesinger said. "I sold the organ in the theater in the early 1980s to a businessman from Chicago who bought it for his wife who was a church organist. They came in and spent about two months carefully identifying each pipe at the rear and on the right side of the stage before removing them for shipment," Griesinger remarked. And then in 1996 I sold the building to Derek Ferguson, who used the theater space for storage for his waterbed business," added Griesinger. Ferguson donated the theater to the Shepherd's Walk Church in 2006. "If they can save the theater I would be happy. And I know Jerry Barilla of the SRG and Scott Dressel have a lot of drive to make this happen," said Gwynne Griesinger. More history will be added as it is discovered.